| Hungarian Import | Brought to life in 2003, the Hungarian entity known as The Moon and the Nightspirit has since been crafting a distinct artistic signature, reflected not only in their music but also in the unique visual universe that illustrates their work. Ágnes, a skilled singer and multi-instrumentist, is also the talented lady responsible for the paintings which bring to The Moon and the Nightspirit’s music a fantasy-setting populated by creatures that trace back to traditional Hungarian legends and folklore. These memories of times forgotten also echo through the lyrics written by guitarist Mihály, which outline the spiritual mindset behind the project. Such a combination has been greeted with growing enthusiasm since the release of their 2005 debut album on Equilibrium, “Of Dreams Forgotten and Fables Untold”, and the early shows that followed, which included an appearance on Hungarian National Television. Later, and in support of “Regõ Rejtem”, their second album, The Moon and the Nightspirit had the opportunity to tour throughout most of Europe. Playing in small fair markets and large festivals alike, including prestigious events such as Trolls et Legendes (Belgium), Wave-Gotik-Treffen (Germany) and Castle Party (Poland), the band shared the stage with names like Corvus Corax, Faun, Blackmore’s Night or Korpiklaani, and gradually conquered a prominent role in the Pagan/Folk scene. For their 3rd album, “Ösforrás”, the band prepared a stunning Digibook presentation, which masterfully combined music and artwork in an invitation into the primordial womb, from which all has sprung, a sacred place where all is one – comes together as an offering to the slumbering gods of the old forests, streams and stones. 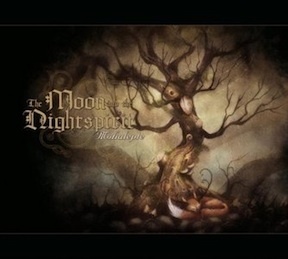 For Mohalepte The Moon and the Nightspirit step into a new era with their long-awaited fourth album – bewitching sylvan music inspired by Mother Nature, in a beautifully packaged Digipak CD, illustrated by Agnes.